Historical trends in climatic variables are of interest in a variety of academic disciplines and economic sectors, such as ecology, agriculture and water resource management. As a consequence, numerous studies1-16 have investigated climatic trends in South Africa, mostly focusing on station records of temperature and rainfall as well as various indices derived from these quantities. The greatest restriction to such studies of historical climate is the availability of long-term meteorological station observations that have sufficient coverage to give an adequate representation of a region's climate. South Africa has a relatively good network of rainfall and temperature recording stations compared to the rest of Africa and much of the southern hemisphere,1-3 which makes it possible to investigate trends and variability over multiple decades. However, it is often difficult to detect clear signals of long-term change given large variability across a range of spatial and temporal scales. This difficulty is particularly relevant for rainfall, which is highly variable in both space and time, thus making any trend calculation sensitive to the specific location and period of the observations. Re-evaluation of trends as new and updated observational data sets become available is therefore necessary and allows for an assessment of how representative a trend over a given record is of underlying long-term climatic changes. 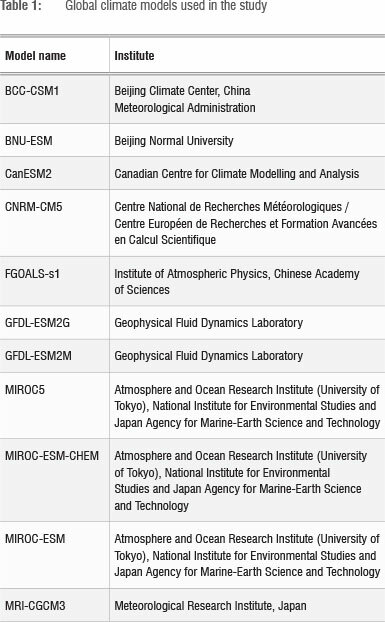 Process-based global climate models (GCMs) are the primary tools used to make projections of future climate under scenarios of anthropogenic greenhouse gas forcing. Although these models generally have skill in replicating large-scale climate features, their coarse spatial resolution does not provide adequate information at local scales. Hence a variety of downscaling procedures, both empirical and dynamical, have been developed in order to represent finer spatial details.17-19 A question that is relevant in the context of historical trend analysis is whether or not the climate models (or downscaled products derived from these models) are able to replicate local trends in rainfall and temperature. When simulating the climatic effects of anthropogenic emissions, the only persistent temporal forcing applied to a GCM is an increasing concentration of greenhouse gases. If an observed historical trend in a climate variable, for example rainfall, is not replicated by such a GCM simulation, it could imply that the change is not a result of an enhanced greenhouse effect. This subject of detection and attribution of anthropogenic climate change has received considerable attention of late.20-22 Alternatively, disagreement between observed and modelled trends could be the result of either (1) weaknesses in the models' representation of key processes at the regional or local scale or (2) uncertainties in the observational record. Both possibilities have implications for the interpretation of both past and future climate projections. In this paper, we present an analysis of climatic trends in rainfall and temperature indices for South Africa for the period 1960-2010 and thus provide an update that will complement previous trend analyses. We first present a review of previous climate trend studies in South Africa to provide a context for our analysis. We then summarise the important modes of variability that are associated with intraseasonal and interannual variations in South Africa's climate and which can have a marked influence on trends calculated over a 50-year period. Finally, we describe the methodology for our trend analysis and present the results. Included in the analysis is a comparison of the observed trends with statistically downscaled climate model simulations. Although some general tendencies are apparent for trends in both rainfall and temperature indices, there is some disagreement between studies. This discord can to a large extent be attributed to two factors: the period over which the data were analysed and the locations of the stations from which data were obtained. Large, naturally occurring variations in climate at yearly and decadal timescales can greatly affect the calculation of trends, so it is important to consider the length of record when evaluating any trend analysis. Regional inferences based on individual stations are reliant on how representative a station or group of stations is of that area and should also be treated with caution. Some studies also rely on gridded products where station records have been interpolated in space onto a continuous surface. Such products should closely match the raw station data in places where the observational record is good, but in data-sparse regions this information is less reliable, especially where strong environmental gradients exist. Details of the methods used to calculate trends also differ between studies, but these should rarely result in substantially different results. Further factors that can influence results are data quality and quality-control measures. Beyond the interannual timescale are decadal-scale variations in climate which provide a slowly evolving background around which higher-frequency modes oscillate. For example, an approximately 18-year cycle in southern African rainfall has been identified in instrumental and proxy records extending back as far as 600 years.36 The cause of this oscillation is not clear, but an 'ENSO-like' multidecadal pattern of variation has been identified at multiple periodicities.37 Interaction between phases of the multidecadal and interannual variations act to enhance or mitigate regional responses.37,38 In the context of the trend analysis presented in this study, it is very important to consider the possible influences of low-frequency variations on the calculation of long-term trends. Trends in the indices for the 1960-2010 period were evaluated using a number of approaches. Firstly, the non-parametric Mann-Kendall trend test was applied. This method has the advantages of making no assumptions about the distribution of the underlying data and being relatively insensitive to outliers. In this method, a correlation coefficient, tau, is computed, which has a value between -1 and 1 and denotes the relative strength of the trend in a time series. The probability of this trend occurring by chance is also estimated, from which a measure of statistical significance can be assigned. We used a 5% level of significance, such that if the probability estimate was less than 0.05, the trend was deemed to be significant. Because tau does not provide an estimate of the absolute magnitude of the trend, we also calculated the slope of the trend using Sen's slope estimator, which is the median of the slopes calculated between all pairs of data points in the series. Like the Mann-Kendall test, this method is also statistically robust and insensitive to outliers in the data. The above trend estimates were calculated for seasonal and annual means for all indices. The results are presented as follows. Firstly, annual and seasonal maps of the Mann-Kendall tau for each station and each variable are shown. These maps depict the relative strength of trends over the historical period at each station and give an indication of any coherent spatial patterns of change. Secondly, annual and seasonal time series plots were generated for six water management zones covering all of South Africa. The zones are those used in the LTAS programme for the assessment of climate change on water resources.40 To calculate these regional time series, an anomaly time series was computed for each station falling within the region by subtracting the 1960-2010 station mean from each value in the series. The resulting series was then summed and divided by the number of stations in that region, after which trend statistics were calculated for the regional mean series. A smoothed curve was added to the figures using a Loess filter with a bandwidth of 0.25. The resulting figures give an indication of the direction and magnitude of long-term trends as well as illustrate interannual and interdecadal variability in the time series. Two important points should be noted here. Firstly, although the definition of the zones has value in a hydro-climatic context, the zones do not necessarily coincide with homogeneous climates and climatic trends. Opposing trends at stations within the same zone will hence weaken any regional signal. Secondly, the stations falling within a particular zone may not necessarily be a good representation of spatial heterogeneity within that zone. This point is particularly true for indices related to rainfall and for zones in which station coverage is sparse. Nevertheless, some useful information can be extracted from these spatially averaged indices. To compare the observed trends for the six water management zones to climate model simulations for the same period, results from 11 different GCM simulations were used. The GCM simulations were obtained from the Coupled Model Intercomparison Project Phase 5 (CMIP5) and have been statistically downscaled to the same stations used in the trend analysis. Although more model simulations exist in the CMIP5 archive, we have limited our analysis to those models that are currently available on CIP and have been downscaled to the relevant stations. The GCMs used are listed in Table 1. The method of downscaling is described in Hewitson and Crane17 and the data are publicly available on CIP Trends for 1960-2010 were computed using Sen's slope estimator for each downscaled GCM, aggregated over the six zones. The results for ppt, rain days, tmax and tmin are presented in Figures 1 to 8. The main findings that emerged from the analysis are summarised below for each of the six water management zones. There is a mixed signal in the spatial distribution of changes in rainfall indices in most seasons, but a tendency for reductions in ppt (Figure 1) at most stations in March-May (MAM), although this reduction is significant at only two stations. A cluster of stations in the Lowveld indicate increased ppt for MAM, but although there is some spatial coherence, the trends are small and not statistically significant. More pronounced trends are seen in the number of rain days (Figure 2), for which a number of stations show significant decreases in the September-November (SON), December-February (DJF) and MAM seasons. Two pairs of nearby stations exhibit contrasting significant trends in rain days. This result could be because of localised environmental conditions interacting in different ways with larger-scale rainfall processes, but a more detailed study of these locations is required to investigate this result further. All but one station show significant increases in tmax (Figure 3), with the strongest warming signal occurring in June-August (JJA) and the weakest in DJF. The strongest warming of tmin occurs in DJF and JJA (Figure 4). Regionally aggregated ppt time series for this zone (Figure 5, top row) show large interannual and decadal-scale variability and no significant trends, but significant reductions occur in the number of rain days in DJF and MAM and in the annual mean (Figure 6, top row). The change in annual mean rain days translates to nearly 16 days over the 50-year period. Significant increases occur in tmax in JJA (0.022 °C/ year) and in the annual mean (0.018 °C/year) (Figure 7, top row), which represent approximately a 1 °C increase over the 50-year period. Changes in tmin are generally smaller, with a 0.011 °C/year increase in annual mean (Figure 8, top row). A consistent spatial pattern of decreased ppt is shown for MAM (Figure 1), but the trends are significant at only three stations. In the southern part of the region in SON, a cluster of stations show increased ppt, but none of these trends is significant. Many stations indicate significant changes in rain days, but spatial coherence is weak (Figure 2). There is a suggestion, however, that coastal stations have experienced decreased rain days, whereas inland locations have experienced increases. A cluster of stations in the southern Drakensberg area, which also extends into Zone 5, shows significant increases in rain days in SON and DJF. Data from only three temperature stations were available for this zone, which all show positive trends for tmax (Figure 3) and tmin (Figure 4), but not all of these trends are significant. No regionally averaged trends are seen in ppt (Figure 5, second row), but overall decreases in rain days are shown in DJF and MAM and in the annual mean (Figure 6, second row). It must be noted, however, that spatial variability in the number of rain day trends for this zone is high, which the regional average does not take into account. The average increase in tmax for the three stations in this zone is highest for the MAM season (0.02 °C/year) and is 0.012 °C/ year for the annual mean (Figure 7, second row). The increase in annual mean tmin is 0.014 °C/year (Figure 8, second row). Opposing signals are shown at individual stations for ppt (Figure 1), with a rough distinction between increased rainfall in the west and decreased rainfall in the east in DJF. There is, however, a general tendency for decreased ppt in MAM. The pattern is similar for the number of rain days (Figure 2), but more stations show significant decreases for MAM. Increases in tmax occurred for all seasons, with the strongest trends seen in JJA (Figure 3). There is, however, a general tendency for reductions in tmin in all seasons (Figure 4). Trends in regional mean ppt are not evident (Figure 5, third row), but decreases in rain days in MAM and in the annual mean of about 6 and 13 days, respectively, are seen over the 50-year period (Figure 6, third row). Strong warming trends in tmax of almost 2 °C (0.034 °C/year) in MAM and almost 1.5 °C (0.029 °C/year) in JJA are evident (Figure 7, third row). 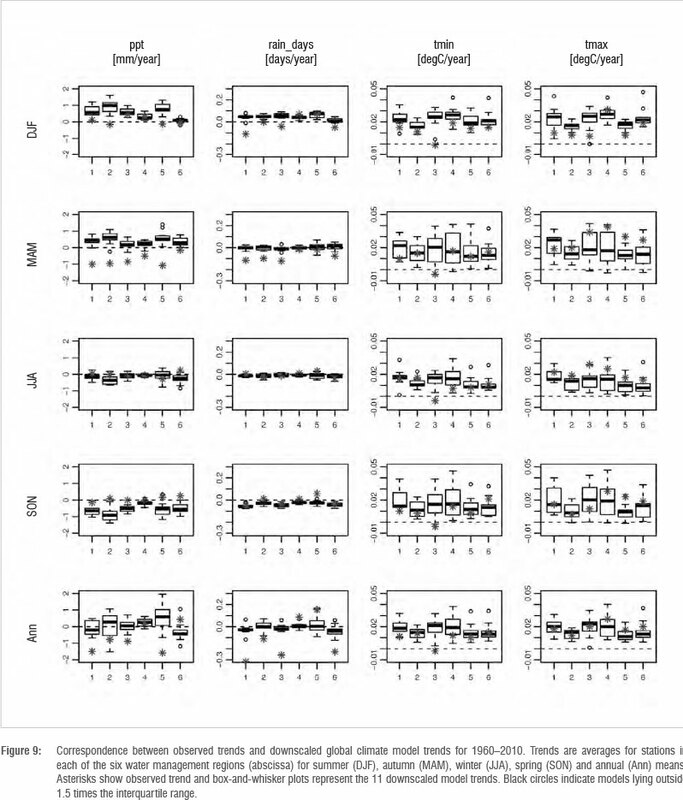 The decreases in tmin as seen at individual stations are not reflected in the aggregated results (Figure 8, third row). Trends in ppt are weak for all stations (Figure 1), but some stations show significant increases in rain days in SON, DJF and JJA and one station shows significant decreases in rain days in MAM and SON (Figure 2). Data available from four stations for tmin indicate mostly significant positive trends (Figure 3) but three of the stations show weaker trends, particularly in JJA and SON (Figure 4). This zone is somewhat problematic as it spans a large climatic range and station coverage within this range is sparse. Regional means should therefore be interpreted with caution. Nevertheless, there are no trends in the aggregated time series of rainfall indices (Figures 5 and 6, fourth row). Tmax shows large significant increases of between 0.025 °C/year and 0.039 °C/year in all seasons, largely as a result of persistently above-average temperatures in the last 10 years of the record (Figure 7, fourth row). Increases in tmin are weaker than those for tmax, ranging from 0.007 °C/year to 0.019 °C/year (Figure 8, fourth row). Changes in ppt are weak (Figure 1), but there are some significant increases in rain days across the region (southern Drakensberg and southern coastal areas) in all seasons (Figure 2). A single station on the northern coast, however, shows a significant reduction in rain days. Stations with temperature data are confined to the southern part of the region, where tmax and tmin have generally increased in all seasons (Figures 3 and 4). Regional means show no significant rainfall changes (Figures 5 and 6, fifth row). Significant increases in tmax (from 0.017 °C/ year to 0.03 °C/year) have occurred in all seasons except DJF (Figure 7, fifth row). Aggregated increases in tmin are generally weaker than for tmax, ranging from 0.008 °C/year to 0.014 °C/year (Figure 8, fifth row). Trends in rainfall indices are generally not significant and show little consistency across the region (Figures 1 and 2). The number of rain days do, however, indicate drier conditions along the southern coastal regions, although the stations near the west coast show a tendency for increased rain days. Tmax and tmin have increased significantly at almost all stations in all seasons (Figures 3 and 4). The regionally aggregated ppt time series show no significant changes (Figure 5, bottom row), but rain days have decreased significantly in DJF (2.5 days) and MAM (3.5 days) and the annual mean has decreased significantly by 11.3 days over the 50-year record (Figure 6, bottom row). Significant increases in tmax are seen for all seasons and range from 0.015 °C/year to 0.027 °C/year, with strong warming occurring in the last 10-12 years of the record (Figure 7, bottom row). Increases in tmin are mostly smaller (0.011 °C/year to 0.021 °C/year) and are not significant for JJA (Figure 8, bottom row). Figure 9 shows a comparison of observed versus modelled trends aggregated for each of the six zones. This comparison gives an indication of whether or not the models captured the long-term trends that emerged from the analysis of observations. Both observed and modelled results represent the same stations and same period, so a direct comparison can be made between the two. Some interesting points can be made. The reductions in ppt for MAM that are evident in the observed trends for almost all regions is not captured by the models. In fact, the models tend to show an opposite trend. Similarly for rain days, the negative trends in Zones 1, 2, 3 and 6 fall outside the range of model simulations. In contrast, for SON, where observed trends are weak, the models show a tendency for reduced ppt in all regions. Strong trends in observed annual rain days lie well outside the model ranges. Overall, the observed trends in rainfall indices are poorly represented by the model simulations. Observed temperature trends generally fall within the range of model simulations, with the notable exception of tmin in Zone 3. Zone 3 is the region for which decreases in tmin were observed and it is interesting that none of the models is able to simulate this decrease. Tendencies for the models to over- or underestimate trends in tmin and tmax vary according to season, region and variable, but some consistencies are apparent - for example, a general underestimation of tmax in MAM and JJA, but an overestimation for both tmin and tmax in DJF. Rainfall indices are particularly influenced by multi-year variations and therefore are highly sensitive to the temporal coverage of observations used. As expected, we demonstrated weak or non-existent trends in regionally aggregated ppt, which is consistent with previous analyses.6-8 More pronounced trends are seen at individual stations, with the most spatially coherent result being an overall tendency for decreased ppt in MAM and a reduction in rain days over the central and northeastern parts of the country. Our results also show a strong and cohesive tendency toward increased rain days, and to a lesser degree ppt, around the southern Drakensberg in DJF and SON. This summer increase is consistent with results previously shown for this location,7 and the springtime increase is suggestive of an earlier seasonal onset. Although other authors9,10,13 have reported increases in rainfall extremes during the 20th century for eastern South Africa, our analysis of the 90th percentile rainfall events (not shown in this paper) do not show much spatial coherence in trends, except for MAM, for which widespread decreases have occurred in line with the decreases shown for ppt and rain days. For the temperature indices, a significant warming trend in tmax is shown for almost all stations, which is in line with recent global and regional warming trends.23 The strongest regionally averaged increase in tmax over the 50-year analysis period reached close to 2 °C in the central interior in autumn, whereas the weakest increase (0.35 °C) occurred in the same region in summer. An interesting result for the central interior is that it experienced a cooling trend in tmin, thus resulting in an increased diurnal temperature range (dtr). The reasons for this finding have not been rigorously explored in this study, but it is possibly related to a reduction in nocturnal cloud cover, more stable ambient atmospheric conditions, or both. Decreases in the number of rain days for much of this region suggest that cloud cover may indeed have been reduced, which would allow for greater radiative cooling of the surface at night. The cause of a reduction in cloud cover could in turn be an enhancement of the mid-tropospheric high pressure system as demonstrated by Engelbrecht et al.41 for a warming climate. Even in the absence of a change in cloud cover, an increase in atmospheric subsidence can promote stable conditions and the formation of nocturnal temperature inversions42 which trap cold air near the surface. We extended our analysis by comparing the observed trends to simulated trends for the same stations and same period from 11 downscaled GCMs. This analysis revealed stark differences in the modelled and observed trends in rainfall indices, but closer agreement for temperature indices. One possible reason for the disagreement in rainfall trends is that the observed trends are not attributable to the effects of increased radiative forcing from greenhouse gases. Although we did not set out to make any robust statements regarding attribution, our findings are consistent with those of Hoerling et al.20 who found similar inconsistencies between observed and GCM-simulated rainfall in southern Africa. Other studies, however, do find a detectable anthropogenic signal in rainfall at larger scales.21,22 Other potential causes of the discrepancies lie in either the GCM formulations themselves, or in the method that has been used to downscale the GCM results to the individual stations. As the downscaling method does not directly use the modelled rainfall, but rather a selection of variables representing regional atmospheric circulation (eg. wind fields and temperature lapse rate),17 these poor results cannot be blamed on the GCM formulation of cloud and rainfall processes. Likely causes are rather (1) poorly replicated atmospheric circulation patterns by the GCMs, (2) an inadequate empirical model linking the circulation fields to local-scale rainfall, or (3) differences in the interannual and decadal-scale temporal variations in climate. The latter point can be interpreted as either the models' inability to adequately represent the regional impact of global climate phenomena such as ENSO, or simply that the temporal evolution of low-frequency climate variations differs markedly from observed (in a freely evolving long-term climate simulation, such variability should not be expected to match observed). In any case, this disagreement between models and observations has implications for assessing projections of future climate over South Africa. Despite the challenges of identifying (and modelling) long-term trends in rainfall over South Africa, there is nevertheless a clear signal of increased temperatures since 1950. This finding has important implications for the functioning of natural systems and related societal impacts and sets a precedent for likely future changes resulting from further anthropogenic global warming. The work presented in this paper forms part of the Long-Term Adaptation Scenarios Flagship Research Programme which is supported by the Department of Environmental Affairs of South Africa, the German Federal Ministry for the Environment, Nature Conservation and Nuclear Safety and the South African National Biodiversity Institute. We also thank two anonymous reviewers for their suggestions to improve the manuscript. N.M. wrote the manuscript, performed the analysis and produced the figures; M.N. provided conceptual oversight; and C.J. provided conceptual input and technical support.